A one-hour video tour of the Walter Miller Collection at The Museum of Automobile History when it was located in Syracuse, New York. The film is presented in separate “clips” that can be viewed in order or however you like. A selection of prints, posters, renderings, and paintings from The Walter Miller Collection. 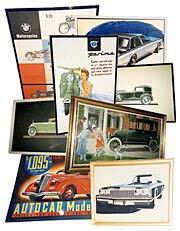 The pieces of artwork and memorabilia collected by Walter Miller span the complete history of the automobile. Picture here are just a few examples of this tremendous collection. Previously on display in Syracuse, New York The Museum of Automobile History has moved to North Carolina. Consult The Museum of Automobile History website for current information. As seen first on the highways! 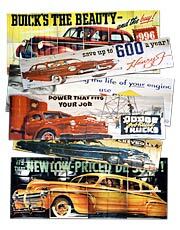 These are original roadside billboards from Walter Miller’s Automobile Memorabilia Collection and represent an important piece of automobile history. These billboards were printed on many small pieces of paper and pasted onto the signs. They typically measure about 21 wide x 9 feet high. 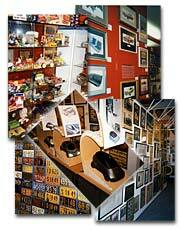 Photos of the exhibition spaces at the Museum when it was located in Syracuse, New York. The Museum of Automobile History, which housed Walter Miller’s Collction, has since moved to North Carolina. Consult The Museum of Automobile History website for current information.